Lipsticks and Lashes: A Lush Haul! Blog land has been filled with posts and tweets about the launch of Lush’s Christmas products lately. I personally did a little squeal! As much as some of their new Christmassy items sound amazing, as that was on my mind was that it meant their ‘Snow Fairy’ shower gel is back in stock! Forget the coca cola advert, this is my sign that Christmas is on its way! 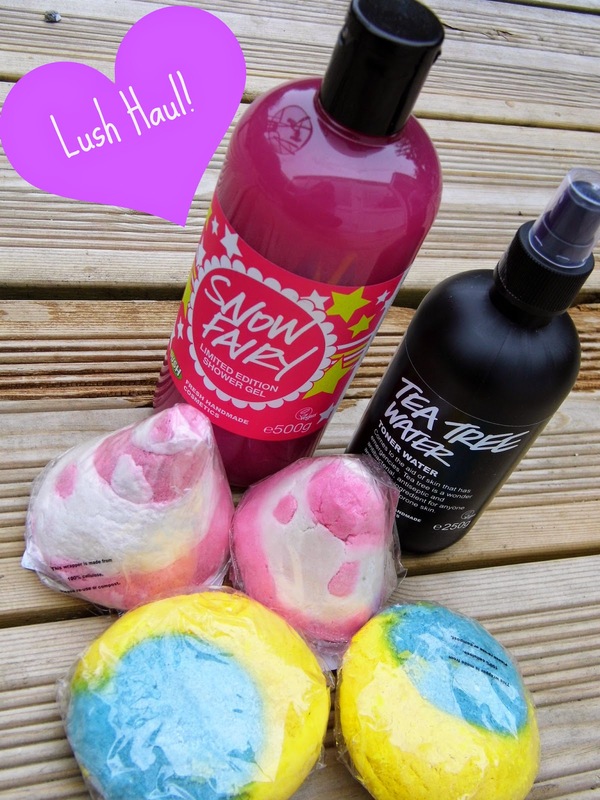 Snow Fairy shower gel, £11.95 – catch the review I did last year here! I will be buying a whole ton more of this between now and Christmas to make sure I am well stocked up into the New Year! Tea Tree Toner Water, £7.95 – I used this religiously up until a while ago and then I decided to try something different. Different isn’t always better as I found out. This stuff is so refreshing and really keeps my face lovely and clean, I am so happy to have it back in my daily routine! Candy Mountain Bubble Bar, £2.75 – I don’t understand why people buy bath bombs when you can have bubble bars! This may be because I am like a 5 year old when it comes to baths and have to have mountains of bubbles! Candy Mountain smells so lovely and sweet, a real girly scent. Christmas Eve Bubble Bar, £2.95 – I bought 2 of these with the idea of giving them out as Christmas pressies or stocking fillers, but xmas is still a little while away so I may have accidentally used them by then! Check out my review of the Christmas Eve Bubble Bar here! What’s your favourite Lush product? Can you recommend any of their new Christmas range for me to try out? I like their Imperialis face cream, I often use that. Not that bothered by Bath bombs but I like the fact their products are more natural as I really try to use nAtural shower held, cream etc. I try to avoid Sodium Laureth Sulfate and parabens and other synthetics, though I spend my life using up products I got as gifts that contain these. You picked up some lovely bits. I need to go in there and get some myself to make Christmas feel even closer haha!